WASHINGTON—Since the late Venezuelan President Hugo Chavez launched the Fifth Republic and the Bolivarian Revolution in 1998, the country has been under siege by the United States. This country’s ruling, business class and political elite has been consistent in ensuring, through force, intimidation and coercion, that nation-states in the Caribbean and Latin and Central America pose no threat to capitalism, the U.S.’ ability to siphon off resources and other forms of capital. 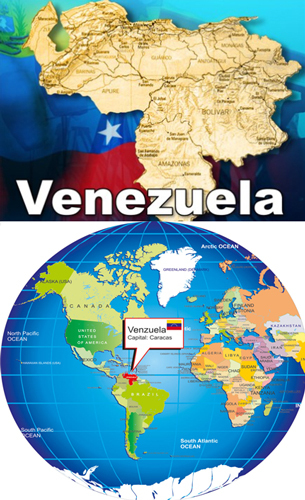 Venezuela is now in America’s sights. Successive presidents since George W. Bush have imposed sanctions against the oil-rich country and between then and now, the U.S. orchestrated a failed coup against President Chavez in 2002 that was reversed 48 hours later because of the support of the military and his considerable popular support. Since assuming office, President Donald Trump and other members of his administration have spoken openly of “regime change,” imposed billions of dollars in new sanctions against the country, revealed the well-known reason that their efforts center on getting their hands on Venezuela’s oil and installing a government that will allow U.S. corporations to move freely to plunder the resources. Since then, Venezuelan President Maduro has been locked in a tense standoff with Mr. Guaidó. 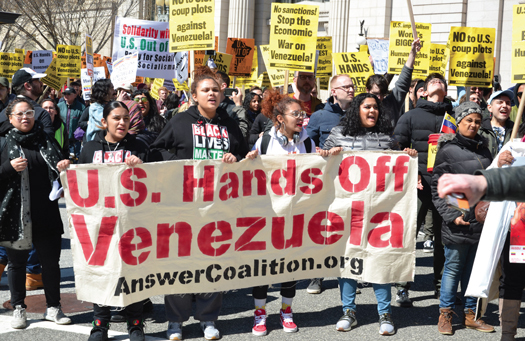 Young people at rally joined others in calling for the U.S. government to cease interference and meddling in the affairs of Venezuela. On Saturday, March 16, participants from an umbrella of organizations took part in a large protest across the street from the White House where speakers criticized America’s efforts to destabilize and overthrow the constitutionally elected socialist government. 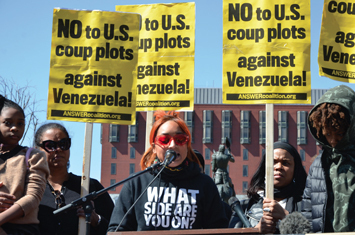 Protestors carried bright yellow placards declaring their position, such as “Not Your Land, Not Your Oil, Hands off Venezuelan soil.” Buses of protestors came from New York, Georgia, Chicago, Albuquerque and all points in between. The crowd was an eclectic mix of young and old, hippies, Millennials, Venezuelans— supporters and opponents of U.S. intervention—indigenous people, Haitians, Palestinians and others. “It’s obviously critically important to be here,” said moderator Eugene Puryear of Justice First. “They want to create dirty war, foment unrest and pit Venezuelans against each other. We’ve seen this story before in Iraq, Libya, and other countries which have been a complete humanitarian disaster. People are trying to eat, trying to survive because of the intervention,” he added. Shortly after the rally started, a small contingent of Maduro opponents gathered. Several shouted out anti-Maduro comments, others stood toe-to-toe with those against intervention jawing at each other. All around Lafayette Park, pairs of people or others in tight circles debated and discussed their truths, some gesturing to emphasize their points, their faces tightening as they spoke. Maduro opponents edged closer to the larger crowd and soon those on each side of the issue stood inches from each other, trying to overpower the words from the other side, shouting and pointing as their agitation spiked. Mounted police and SWAT team members stepped in quickly to restore order, encouraging the anti-Maduro crowd to move back. Katherine Savatierre stood watching the rally in between engaging with those who held a differing view. “I’m here because there’s no food, no medicine, no power,” she said, trying to hold back tears. “My mom, father and grandmother are in Venezuela. I’m here with my sister. It is because of Maduro. He administers water and power. Gabriela Febres alternated between arguing with a young Black man from Baltimore and talking into the mic held by a journalist. Fellow Venezuelan Eleazar Basero stood holding up two Venezuelan flags alongside his friend Yhamir Chabur. Mr. Basero said he was last in his country in 2016 but has family there and follows news from Venezuela closely. Mr. Basero said it needs to be made clear that the real beneficiaries of a U.S. invasion would be the Koch Brothers, who have a substantial stake in the oil industry in Venezuela. “(Secretary of State Mike) Pompeo, (Vice President Mike) Pence and others owe their careers to the Koch Brothers. They have to give something back … being a part of this is very important because we’re standing on the right side of history. People here want peace and a new type of government,” he added. A war already in progress? Speakers during the almost twohour program included Cindy Sheehan, legendary Gold Star mother and peace activist; Max Blumenthal, journalist, author and senior editor of the Grayzone Project; Brian Becker, executive director of the A.N.S.W.E.R. Coalition; Medea Benjamin, co-founder of CODE PINK; Rev. Graylan Hagler, senior minister of Plymouth Congregational Church; Gloria La Riva, national coordinator of the Cuba and Venezuela Solidarity Committee and Anya Parampil, a journalist with The Grayzone Project. “With that gang that has taken over in the White House, anything is possible,” Ms. Parampil told the crowd. “They have filled the administration with John Bolton and Elliot Abrams. They are creating terror in Venezuela. People are terrified, afraid of a U.S. intervention. A woman I talked to down there said we watched the U.S. destroy Iraq and Syria. And now they want to do the same to us. It’s psychological warfare. The U.S. is creating a pretext for a military invasion, but it didn’t happen. Venezuelans aren’t afraid to fight,” she said. Speakers representing various organizations address crowd. To illustrate Ms. Parampil’s point, earlier this year, the U.S. government seized $7 billion of Venezuelan oil assets from Venezuelan oil company, Petróleos de Venezuela, S.A. (PDVSA), leaving it “at the disposal of the legitimate interim president,” Mr. Guaidó. Meanwhile, after pressure from Mr. Pompeo and Mr. Bolton, the Bank of England is refusing to release 14 tons valued at $1.2 billion to the Venezuelan government and according to Jorge Martin of Marxist.com, Mr. Guaidó has lobbied the British government to put these assets at his disposal as well. Max Blumenthal, journalist, author, senior editor of the Grayzone Project, has written extensively about the situation and developments in Venezuela. Juan Guaidó, Mr. Blumenthal wrote in a story co-authored with Dan Cohen, is the product of a decade-long project overseen by Washington’s elite regime- change trainers. “While posing as a champion of democracy, he has spent years at the forefront of a violent campaign of destabilization,” they contend. And echoing the Washington consensus, they said, the New York Times editorial board hailed Mr. Guaidó as a “credible rival” to Mr. Maduro with a “refreshing style and vision of taking the country forward.” The Bloomberg News editorial board applauded him for seeking “restoration of democracy” and the Wall Street Journal declared him “a new democratic leader.” Meanwhile, Canada, numerous European nations, Israel, and the bloc of right-wing Latin American governments known as the Lima Group recognized Guaidó as the legitimate leader of Venezuela. A U.S. attempt to force the distribution of tons of food and medicine to desperate Venezuelans in February was a humanitarian mission with a starkly political objective: to foment regime change. President Maduro blockaded the Columbia border crossing, refusing to allow entry of the aid. Some members of the opposition burned some trucks, but the effort failed to tilt the masses away from support of the government. President Maduro described the aid as a Trojan horse for an eventual U.S. invasion. “Humanitarian aid has been turned into a spectacle to justify a military intervention of our country,” President Maduro said in a news conference in Caracas in early February. For their part, administration officials acknowledged that the plan was designed to provoke a negative reaction from President Maduro. The hope was to coax Venezuelan military officers to defy the president’s orders and allow the aid to flow into the battered country. As the impasse drags on, ordinary Venezuelans continue to suffer. Total oil output is about 1.1 million barrels a day and oil revenue accounts for about 95 percent of the country’s export revenue. In 2008, the price of a barrel of oil was $160.72 per barrel. It slipped to $51.99 per barrel in January 2019. Hyperinflation dogs the nation with the one million percent inflation. Empty shelves illustrate the severe shortage of basic foodstuffs, toilet paper, flour and milk, which has led to hunger and malnutrition. Antibiotics and other medicines are scarce, the costs of basic items continue to rise, all indicators pointing to the gradual collapse of the economy of the world’s fifth largest oil producer in the world. To date, more than three million Venezuelans have fled the country. People are desperate and getting more so.